Jakarta has expressed serious interest in the capable supersonic cruise missile. The Indonesian Navy already operates the Soviet-designed, Russian-made Yakhont export variant of the P-800 Oniks (3M55) supersonic cruise missile. Those missiles are deployed in vertical launch systems on board a single Indonesian Navy Ahmad Yani-class frigate, the KRI Oswald Siahaan. 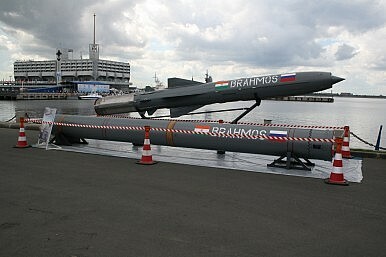 It’s unclear if the BrahMos purchase would represent a larger procurement than the limited numbers in which Jakarta purchased the Yakhont. The BrahMos missile is based on the Yakhont, which itself was a ramjet version of the the P-80 Zubr, a Soviet anti-ship missile. A particular obstacle to Indonesia’s purchase of the BrahMos in the coming years could be the prospect of U.S. sanctions under the Countering America’s Adversaries Through Sanctions Act (CAATSA), which targets customers of Russian defense exports. Even with Indian participation in the joint venture, Brahmos Aerospace could come under scrutiny given its status as a joint venture between Russia’s NPO Mashinostroyenia and India’s Defense Research and Development Organization. To purchase the missile without seeing sanctions, Jakarta would require a waiver. Defense cooperation between India and Indonesia has advanced in recent years; New Delhi sees Jakarta as an important partner in its “Act East” policy toward East and Southeast Asia. Last year, the two countries began a joint initiative at the strategic Indonesian port of Sabang, which sits just off the northern tip of Sumatra, astride the Malacca Strait some 90 nautical miles from India’s own Andaman and Nicobar Islands.